mountain range under ice several thousand feet thick. 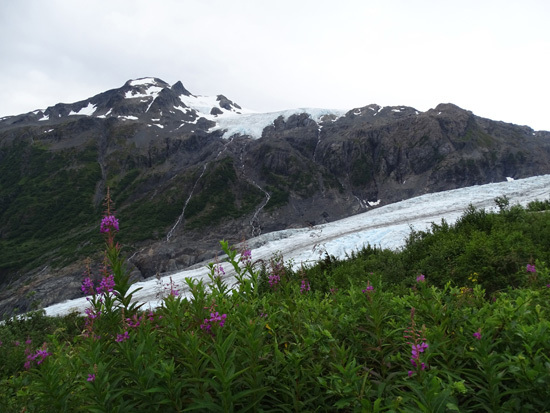 One of my best memories of Alaska from our first trip three years ago was hiking up to the Harding Icefield. 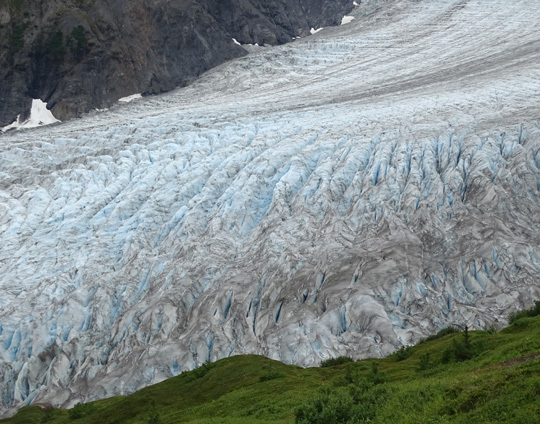 Fifty feet long and thirty feet wide, the Harding Icefield blankets a large portion of the Kenai Mountain Range. 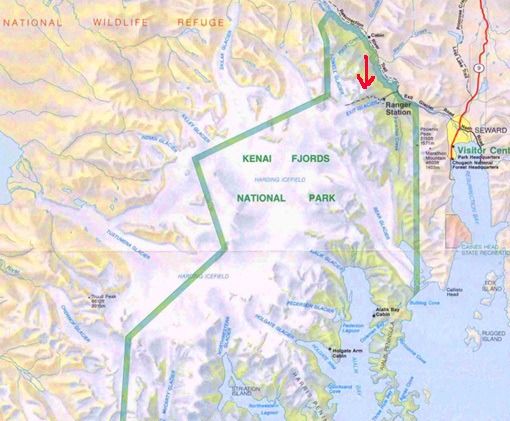 Green line shows part of the park boundary; arrow marks Harding Icefield Trail we hiked. How many people ever get right up next to an ice field, especially by foot?? That was first on my list of things to do in Seward this trip and I really wanted Jim to see it, too, since he wasn't with me on my first hike up there. NOAA predicted mostly sunny this morning, with a 20% chance of showers after 1 PM. That didn't happen -- and I didn't take the sunny photo above until two days later. Well phooey!! That was initially frustrating for me but the clouds turned out to be A Good Thing. OK, so that looks really "cool." But all I could see up there was a vast expanse of white with some black spots indicating the rocky peaks of buried mountains. 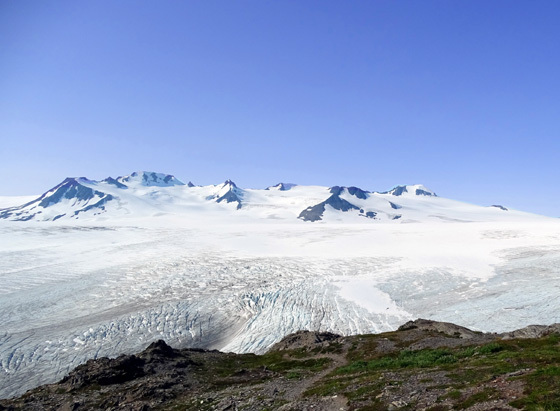 I still think that the views of the ice field, Exit Glacier, surrounding mountains, and Resurrection Valley are prettier when it's sunny. Just compare the first photo of the nunataks in the ice field against bright blue sky at the beginning of this entry (I took that one two days later this year, on Friday) with the other pictures I'll show later in this entry when clouds obscured most of the peaks like they did three years ago. 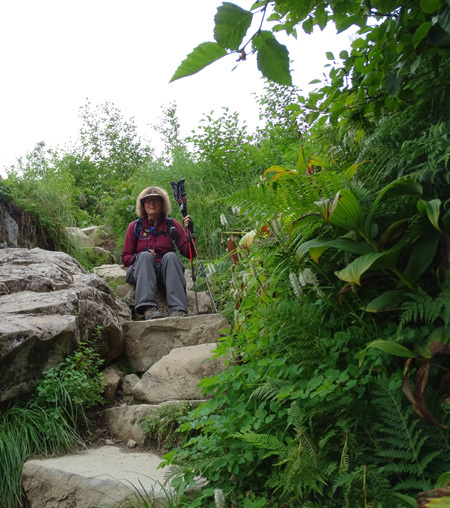 Although I was disappointed that it was overcast again today, the clouds were a blessing in disguise because Jim said later that he wouldn't have gone all the way up the trail -- 4� miles to the point where he turned around -- if it had been sunny. And I really wanted him to experience the rewards of this hike. 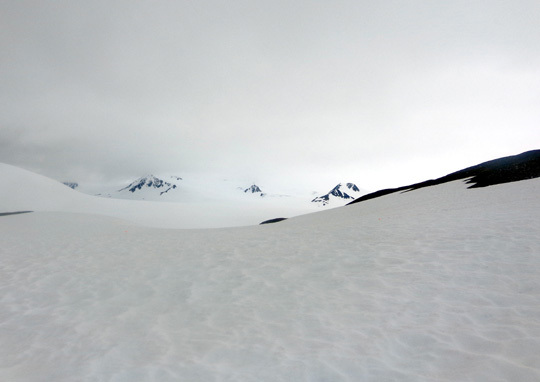 the background is part of a hanging glacier at the edge of the ice field. 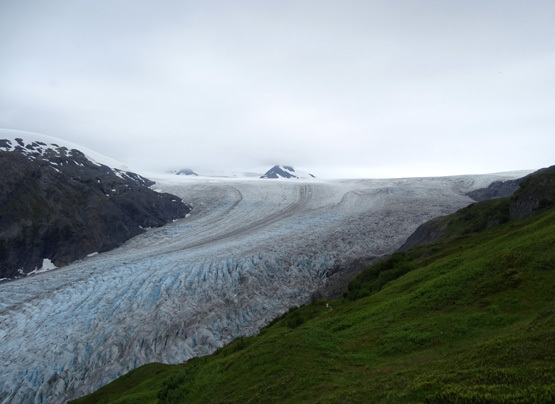 I was happy when he said he'd try to go up a couple miles to Marmot Meadows, one of the overlooks above Exit Glacier. I was thrilled when we reached that point and he agreed to continue to The Cliffs. 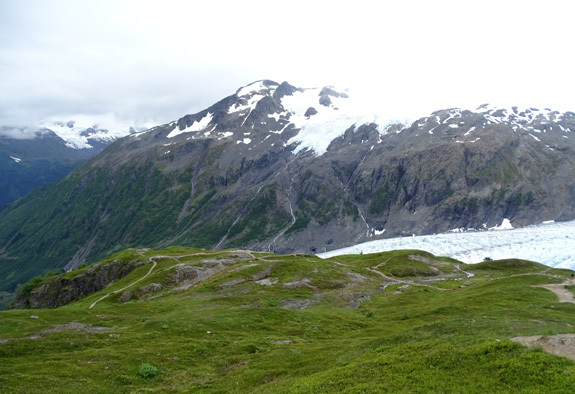 I couldn't believe it when he then wanted to go all the way to the end of the trail above the ice field! 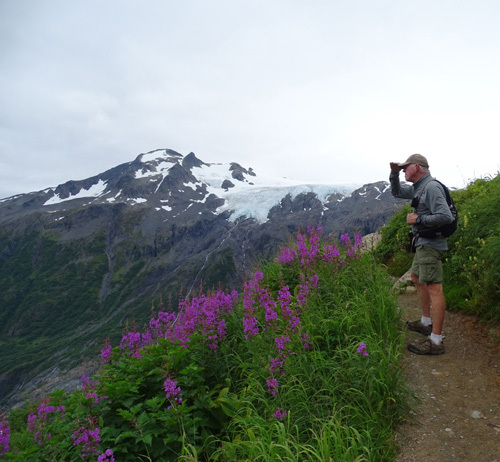 He hasn't done a nine-mile hike for several years because of the knee he injured in a bike accident. 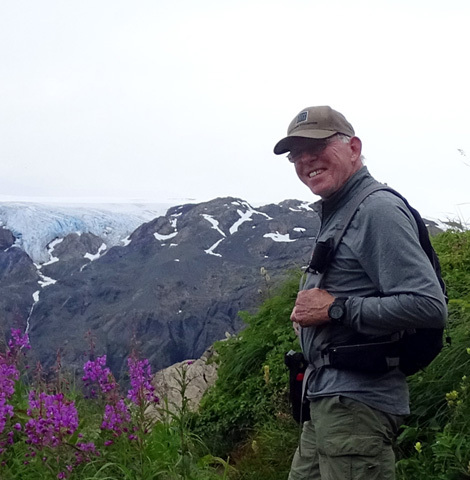 Jim loved the views from the trail and the unique scenery up at the ice field. 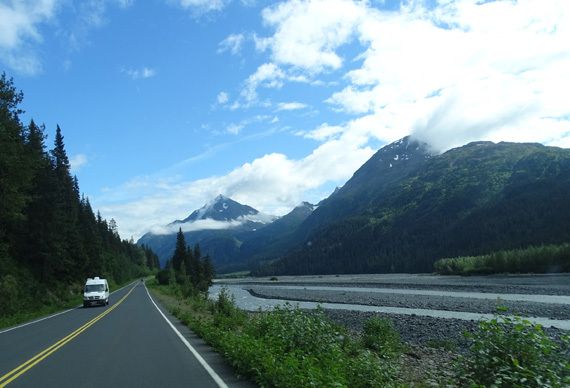 He said it's now one of his best memories of Alaska, too. I'm glad I finally got to share it with him. Bring on the clouds, if that's what it takes. The good news is, there is no entry or parking fee to visit this park. That's unusual for a national park. 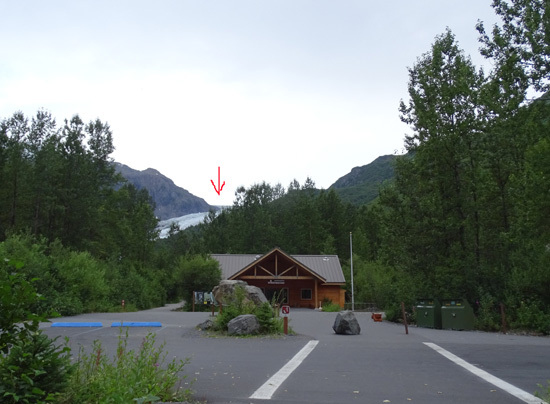 You can see the nature center, go hiking on a network of trails at the bottom of Exit Glacier (one trail is handicapped-accessible), attend ranger talks and hikes, and/or go up to the ice field -- all for free! The only bad news is that dogs aren't allowed on the trails. That IS typical of our national parks. 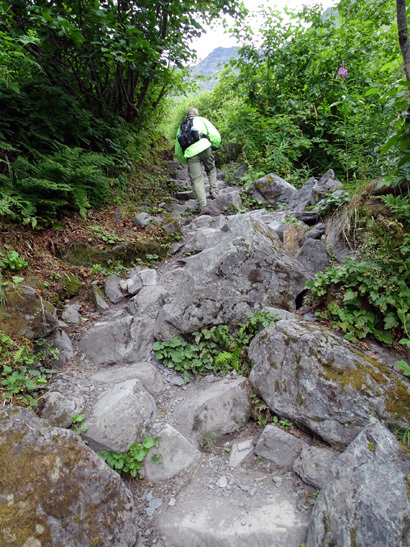 Jim and I hiked a paved and crushed rock path 4/10ths of a mile to the trailhead for the Harding Icefield Trail. 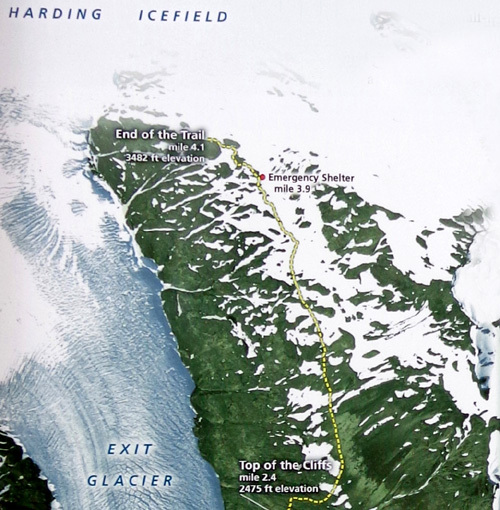 From there, the sign says it's 4.1 miles to the top end of the trail (= 9 miles out and back) but you can continue farther than that if you wish, depending on trail conditions. Jim stopped at that high point and waited for me while I wandered a little farther down the trail toward the ice. 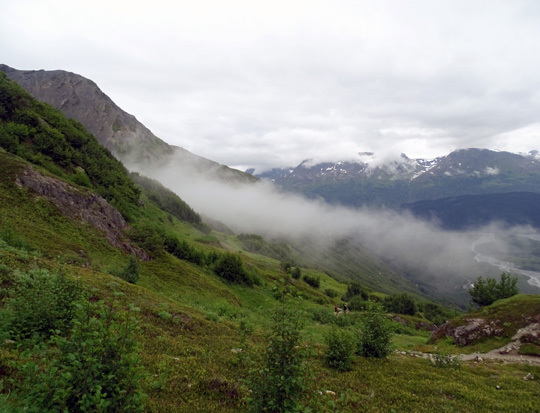 Following are photos from the Harding Icefield trailhead in the valley up to the ice field itself. 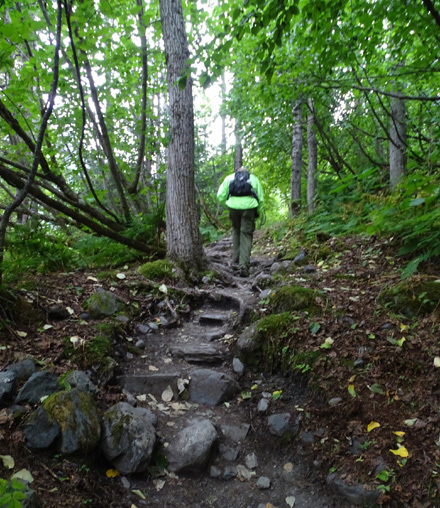 The trail is almost all single-track and much of it is rocky in the first three miles. It doesn't smooth out until after it crosses a boulder field just above the top of "The Cliffs." 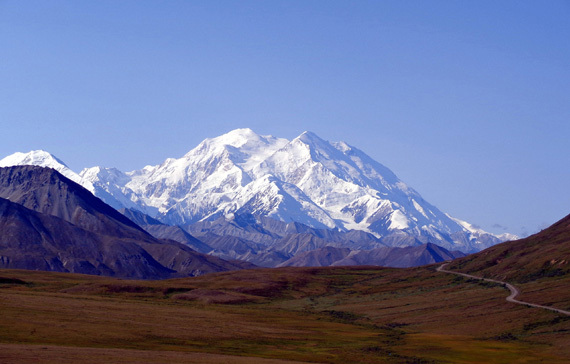 As on any mountain the trees get shorter and more sparse the higher you climb. 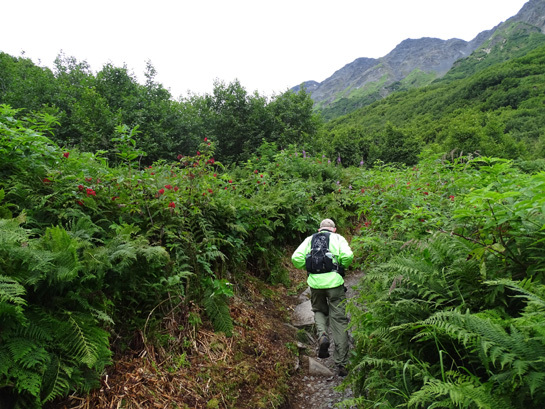 This time of year the trail is very lush, almost jungle-like, with numerous flowers and berries. 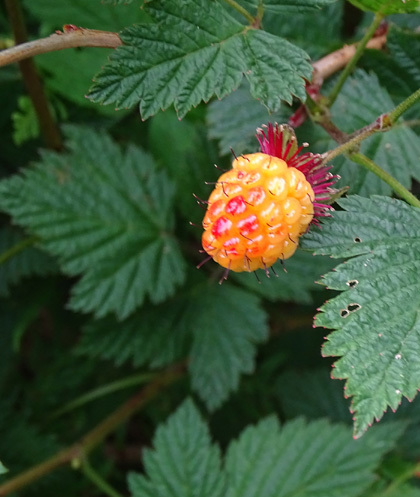 There are lots of salmonberry bushes along the trail. We thought they were a type of red raspberry until a local told us what they really are. 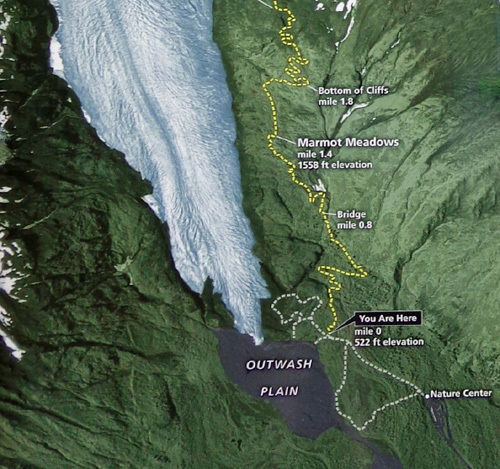 Another hiker showed us where his family found blueberries. They weren't as plump and sweet as the ones I found on the Twin Peaks Trail above Lake Eklutna. 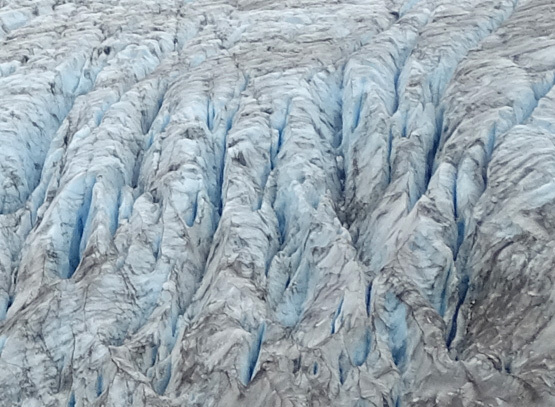 how deep these crevasses are. I love the blue glow in the ice from reflected light. 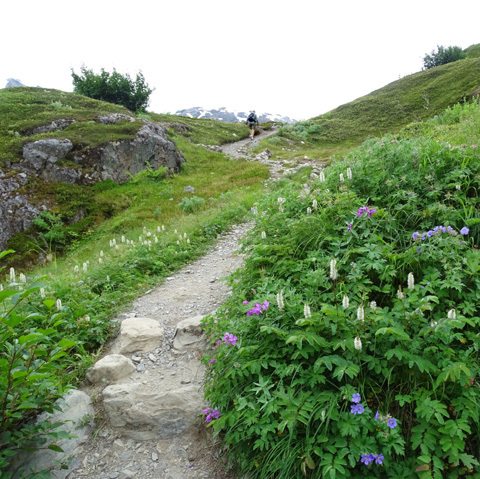 An advantage of going up the trail later in the season than I did three years ago is that there were more flowers everywhere this time, especially above tree line. You'll see them in many of the photos in this entry. 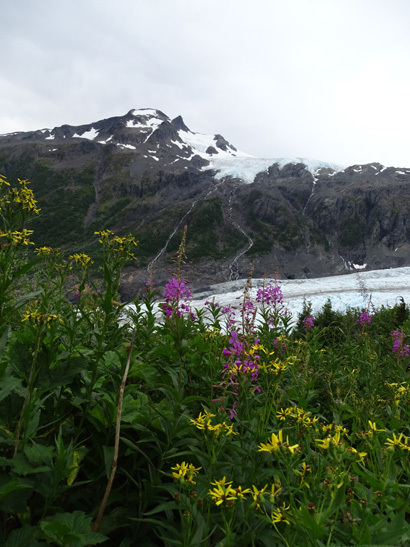 There were lots of tall and dwarf fireweeds in the second and third miles, cream and yellow Indian paintbrush, blue geraniums, monkshood, harebells, and forget-me-nots, white bog orchid and yarrow, yellow mountain sunflowers/daisies, pale pink mountain heather, and lavender asters. Those are just the ones I know. 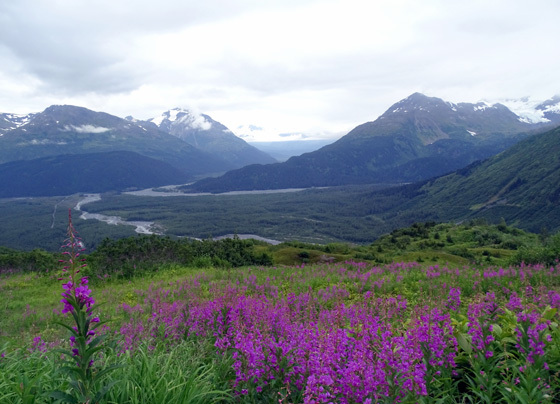 Tall fireweed usually grows at lower elevations (above), dwarf at higher ones. 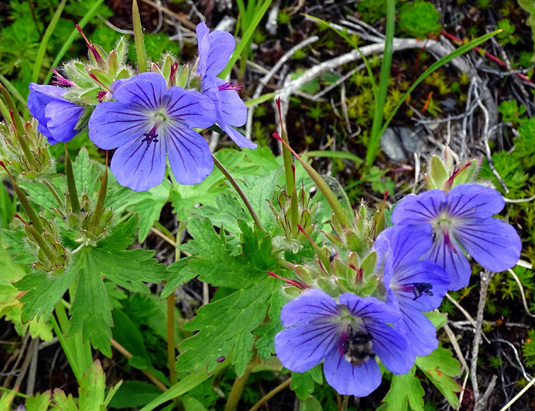 Bog orchids, geraniums, fireweeds, etc. 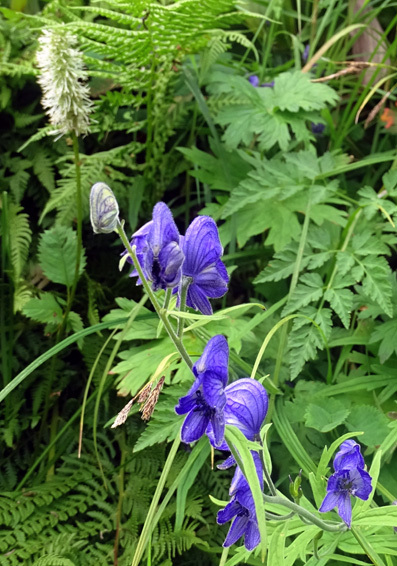 I'll include other flower photos where I saw them as we climbed higher. From what we heard and from what I've observed on three trips up this trail, most hikers stop at the top of "The Cliffs" at a broad, grassy overlook.